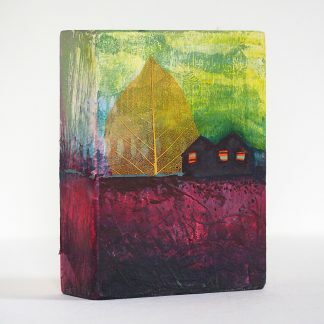 This small mixed media wall hanging consists of a reclaimed plywood panel with a driftwood hanger. 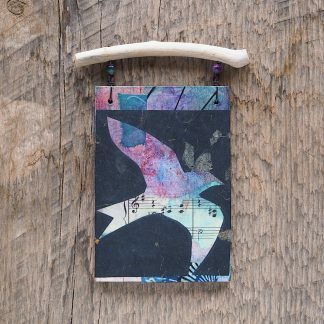 The panel features a collage of a bird in flight in shades of red and orange, incorporating vintage sheet music and cut paper. The hanger is laced to the panel with wire and colorful beads. Total height is 61/4″, total width is 4 1/2″ (15.9 cm x 11.4 cm).